In one of three reports from IFAR’s Authentication Research Service in this Journal issue, IFAR’s Art Research Director and Executive Director discuss IFAR’s research concerning a purported Braque painting that was one of the dozens of works from the Walter P. Chrysler, Jr. Collection that were publicly denounced as fakes in the early 1960s. IFAR’s Art Research Director discusses the attribution, well-documented 200-year history, and research concerning a double portrait submitted to IFAR’s Authentication Research Service as a painting by Anthony van Dyck. All in the (Mount) Family: Which Sportsman at the Well Is Autograph? A painting was submitted to IFAR’s Authentication Research Service that was nearly identical to a work by William Sidney Mount in a museum collection. This article by IFAR’s Art Research Director discusses IFAR’s extensive research on the painting and comparative analysis with the “accepted” other work. The author, a former Research Associate at IFAR and now at the Metropolitan Museum, reviews the exhibition catalogue Gurlitt: Status Report, which accompanied two concurrent 2017-2018 exhibitions, one at the Kunstmuseum Bern in Switzerland and the other at the Bundeskunsthalle in Bonn, Germany. The exhibitions, and the catalogue, shed light on the complexity of doing provenance research on the works in the Gurlitt Collection, also known as The Schwabing Art Trove or The Munich Art Trove, and the questionable activities of art dealer Hildebrand Gurlitt, who amassed the collection during the Third Reich and WWII. News & Updates: Real Estate Developers Versus Graffiti Artists: Has the 5Pointz Case Shifted the Balance? 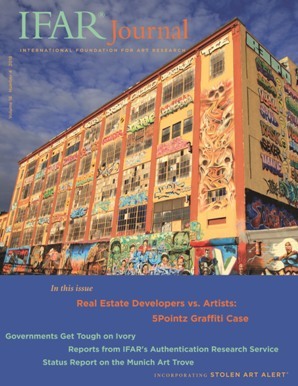 The author, a legal intern at IFAR, discusses the landmark case Cohen v. G&M Realty L.P., wherein 21 graffiti artists successfully sued a real estate developer under the Visual Artists Rights Act (VARA) for whitewashing a building they’d painted without prior notice. The artists had been granted permission by the owner to use the building with the understanding that it would eventually be destroyed. The case raised the question of whether graffiti art can be deemed work of “recognized stature” under VARA. In a report on a topic covered previously in IFAR Journal (see Vol. 17. no. 1), IFAR’s Legal Associate and Executive Director report on recent legislation in China and Hong Kong and a proposed UK ban on ivory sales and the import and export of ivory. The UK ban contains exemptions that would ameliorate its impact on the art trade. The article also discussed legal cases brought in the U.S. under New York State’s stringent ivory regulations. In an update on a story covered previously in IFAR Journal (see Vol. 12, no. 2 and Vol. 16, nos. 1&2), IFAR’s Executive Director reports on a the decision by France’s highest court to overturn the verdict and remand the case against Picasso’s electrician, Pierre Le Guennec, and his wife, who were convicted in March 2015 of possessing stolen goods, specifically, a large cache of works by Picasso. An update on a case reported on previously in IFAR Journal (see Vol. 18, nos. 2&3), Mayor Gallery Ltd. v. Agnes Martin Catalogue Raisonné LLC. The case involves the rejection of works submitted to the catalogue raisonné committee. The New York State Supreme Court dismissed the case in April. A discussion of the civil fraud dispute, Baldwin v. Boone, filed in September 2016 and ended in November 2017, in which collector Alec Baldwin claimed that the Ross Bleckner painting sold to him in 2010 by gallerist Mary Boone was not the painting he believed it to be. In an update to a story covered previously in IFAR Journal (see Vol. 16, no. 3), in October 2017, the U.S. Attorney for the Southern District of New York announced the return to Brazil of 95 works of art once owned by the disgraced Brazilian banker, Edemar Cid Ferreira, who had purchased the art with embezzled funds. A discussion of the signed bilateral agreement signed by Libya and the U.S. in February 2018 to restrict the importation of certain types of at risk cultural property. Stolen items include Thomas Cole’s Study for the Course of Empire: The Arcadian or Pastoral State and five other paintings stolen in Brooklyn, NY; Giorgio de Chirico’s Composition with Self-Portrait, stolen in France; works on paper by Russian avant-garde artists, all part of The Golden Book of Maria Samoilova Zetlin, stolen in Paris, France. Missing items include three paintings by Luciano Castelli and Rainer Fetting; Tony Cragg’s watercolor Untitled, 2010, number 4225; John Whorf’s watercolor The Dark Bow.